So Really, Why Does Asparagus Make Your Pee Smell? It's an accepted fact that asparagus makes your pee smell funky, but have you ever stopped to question why? You should! It's a completely harmless occurrence, but that doesn't make the reasons behind it any less interesting. So we reached out to Dr. Ashley Winter, a six-year urology resident, to enlighten us. We're here to ask the tough questions. What’s going on here? Why does asparagus make your pee smell? Winter says: "People have been talking about asparagus-urine since the 1700s. In fact, Benjamin Franklin wrote in 1780, 'A few stems of asparagus eaten, shall give our urine a disagreeable odour.' Nevertheless, we don't know exactly what causes the unique smell. The culprit is generally believed to be digestive products of asparagusic (yes, asparagusic) acid. 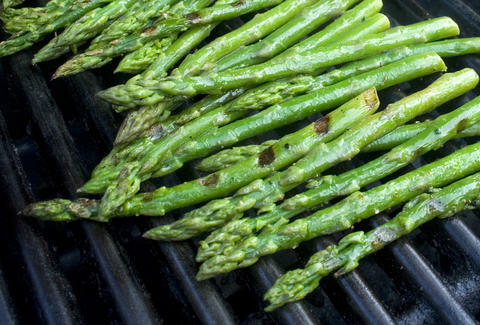 Asparagusic acid is a sulfur-containing compound that is unique to asparagus. Sulfur-containing compounds are responsible for such lovely odors as rotten eggs. "But asparagusic acid is a precursor in the digestive process; no scientific studies have figured out what the actual molecule is that hits your nose when you smell the asparagus-tainted pee." Are the Meat Sweats Real? A Brief Investigation. Can everyone smell it or only certain folks? Winter says: "Beauty is in the eye of the beholder... or, asparagus-urine stench is in the nose of the smeller... AND actually depends on the pee-producer. "Urine that smells foul after a nice asparagus salad is actually a multifaceted phenomenon. Some people make asparagus-stench urine, but some don't (producers vs. non-producers). What’s even more complicated is that some people can't smell asparagus-stench urine, no matter whether or not the smell is actually there (detectors vsn non-detectors)! We don't know exactly why people differ so much, but it seems to be an inherited/genetic trait you are stuck with. "The reported rates of 'inability to smell asparagus urine' have ranged from 76% to 90% of people in some studies. We don't know the true rate, but it may vary based on the group you look at. "Given that most people (myself excluded) don't spend a ton of time talking about urine, you may have a friend or two who actually have no idea this is even a thing. Seriously. Ask around." Why is it so particular to asparagus? Winter says: "We think it is because asparagusic acid is only found in asparagus. But to be honest, researchers identified asparagusic acid with a goal of finding a chemical that is only in asparagus... a bit of circular logic." Can you eat a specific part of it and not get smelly urine? Is it in the stalk? The top part? Winter says: "The concentration of asparagusic acid is higher in the tips. Seriously though, are you not going to eat that part? That would be like only eating the crust of the pizza." Why does it happen so fast? Winter says: "Just the metabolism. Many compounds we eat are modified rapidly after we eat them." Is there a preparation that neutralizes whatever chemical it is? Frying, boiling, roasting, etc. Winter says: "Actually, asparagusic acid is detected in both raw and cooked asparagus; there is no culinary secret to making it go away." Are there other foods that do this same thing? Coffee's been known to make urine smell funny. Winter says: "Many foods can make your urine smell odd, although the mechanism is not the same." And on a related note, do you know why beets turn urine pink? Winter says: "Pink urine from beets is known as 'beeturia,' and happens because the pink pigments from beets (known as betacyanins) can be excreted in urine. The main factor determining the color of your urine is whether or not the pigments actually make it to your kidneys. To get there, they have to avoid being broken down in the digestive process. Most of the breakdown of these pigments happen in a normally functioning, acidic stomach. So if you are taking an an antacid, you may be more likely to get pink pee."